Liverpool may be facing problems with the Nabil Fekir transfer despite it looking for so long like being a done deal for the Lyon attacker. The Guardian are reporting that the Reds’ £53million move for the France international is now in doubt due to fitness fears after he had a medical with the club. This seems disappointing news for Liverpool fans considering Fekir’s superb performances for Lyon last season, but there are other options out there. 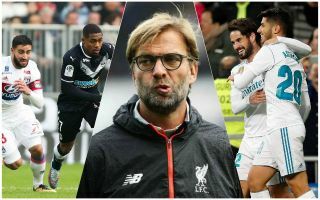 Monaco winger Thomas Lemar as an alternative to Nabil Fekir for Liverpool? Another top talent from Ligue 1, Thomas Lemar’s name has been mentioned alongside big clubs for months now as he’s surely unlikely to continue at Monaco for much longer. It’s been claimed Liverpool may have been targeting Lemar alongside Fekir anyway, and now seems the ideal time to step up their interest. The Times have also linked the 22-year-old with Manchester United and report that he may cost as much as £90m, so while he’d be considerably more expensive than Fekir, it could be worth the investment.